With the release of Windows 10 Technical Preview, the Avalon IT team thought you would like to know what new features will be available in Windows 10. 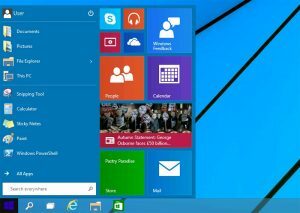 Microsoft wants to show that is creating a new, feature rich and more user-friendly Windows operating system. In order to do this, they wanted to merge the usability of Windows 7 with the features and look of Windows 8. 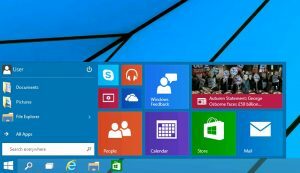 Windows Start Menu – is it back? I’m pleased to say yes it is, with the addition of tiles! The new start menu features the familiar look of Windows 7 on the left with the new (more Windows 8 looking) tiles on the right. You can drag the tiles around to where you would like them to give you the advantage of seeing what you want to see, where you want to see it. The other change is that the entire start menu is resizable. 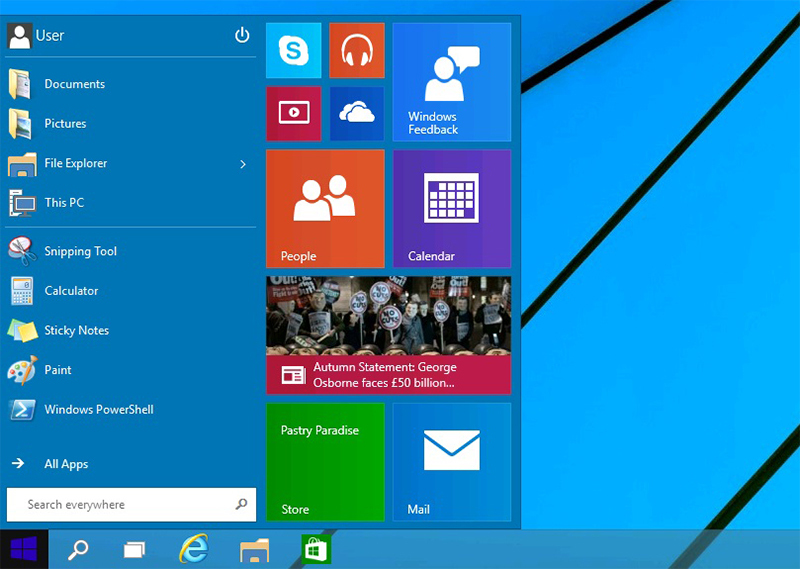 Simple drag the top of the start menu down towards the taskbar and you could have a much wider looking start menu. You will also notice that the shut down/Restart button is now located at the top of the start menu rather than the bottom right as seen in Windows 7. If you click the User account picture (top left), you will find the options of Change account picture, Lock and Sign Out. The search function has been refined in Windows 10. 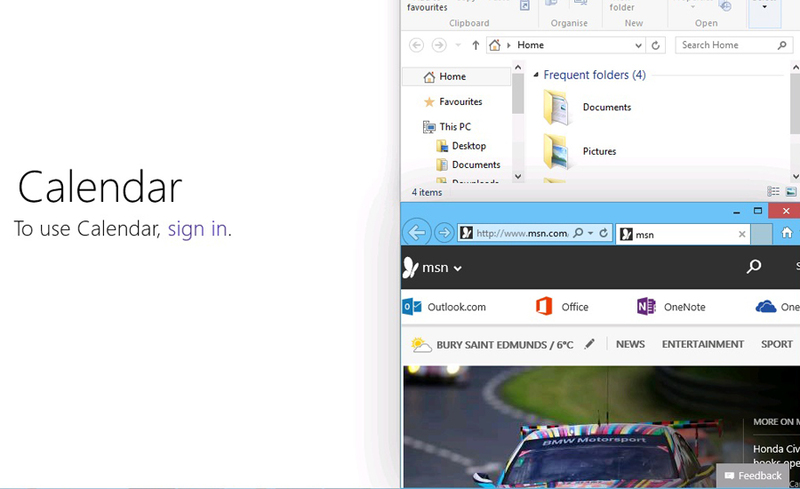 You can now click the start button and search for content rather than having to open the start tiles like in Windows 8. I can gladly say that the Windows 8 feature of searching for files, settings and the internet is still available all under one search when using the Windows 10 search. This is to make multitasking easier to manage. Simply click the Task View button and all your open windows, apps and programs will appear in a horizontal row. This will allow you to easily switch between tasks (much like the old Win+Tab shortcut) or close them by click the cross above each open window. Another feature that has been added to Windows 10 within Task View is the introduction of virtual desktops. The use of virtual desktops will allow users the ability to work on different desktops under one account. For example, you might have one desktop for work/business and another for personal items – It is unclear at the moment as to how many virtual desktops you can have. Windows 7 saw the introduction of Snap View. Snap View allowed users to drag a window to the left or right of the screen to create a split screen, this made working on two things at once a lot easier, just like having two screens. In Windows 10 we can see that this has now evolved further. You can still split the screen by dragging a window to the left of the screen except this time it gives you a choice of what program, app or window you would want to have next to it. Also, if splitting the screen wasn’t enough, if you drag a window to the top right it will give the option to split the screen four ways! Great news if you are working on a large 4k screen but probably not the best option for average screen but, a great new feature nonetheless! 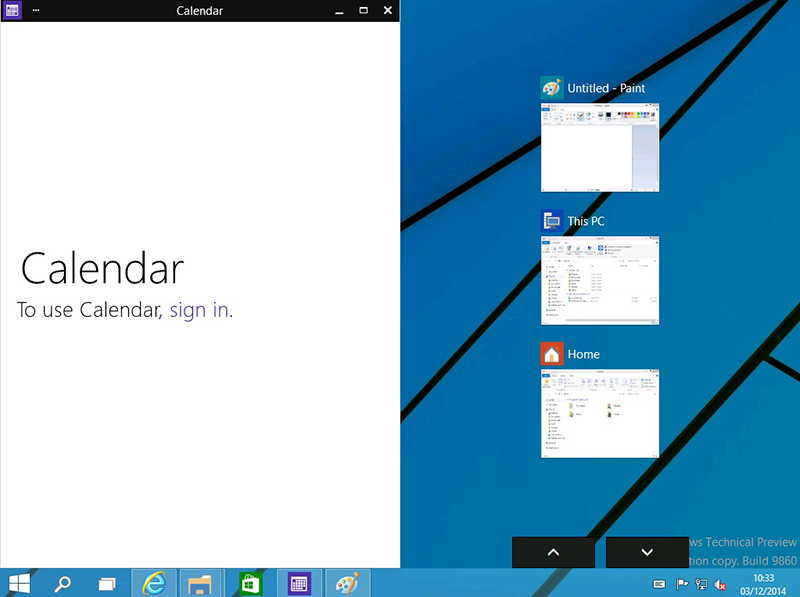 More features of Windows 10 will be released early in the new year with a possible release late 2015.